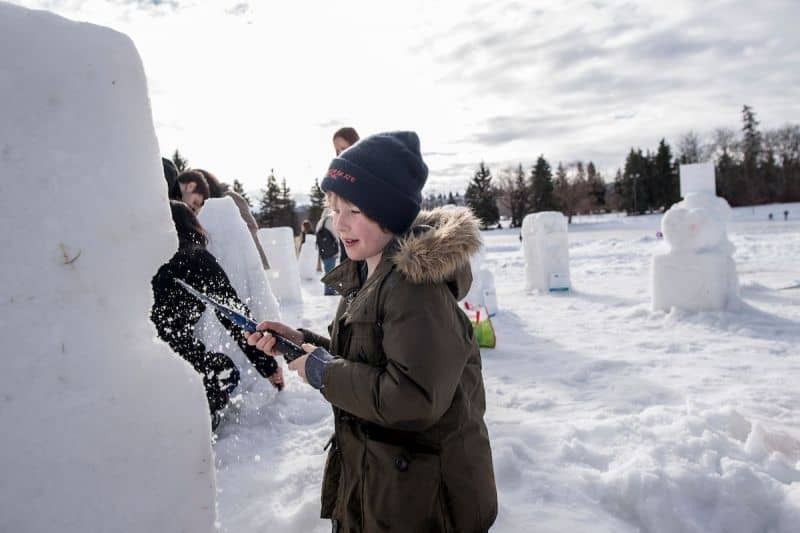 Teams from Edmonton, Red Deer, Belgium-France, United Kingdom, and Mexico create works of art from eight blocks of snow measuring 8’ x 8’ x 8’, making an ephemeral sculpture garden for the Silver Skate audiences to enjoy throughout the Festival. What could be more Canadian than an aboriginal encampment, or dog sledding? At the Heritage Village, festival goers get a taste of Canada’s pioneer history, something that both new Canadians and fourth-generation Canucks will appreciate. Join us to participate in an interpretive Cree Winter Camp, which will teach visitors about how the Cree people relied on their natural surroundings for survival. Also, watch blacksmiths forge the primary tools of the trade. These techniques are the same as those used to produce Damascus steel, artwork, wrought iron, and are still used today to recreate historic hardware. Each year, our nomadic performers delight audiences by acting out a story for several nights during the festival. This is interactive theatre at its best and festival goers are encouraged to participate by writing down their regrets, unhappy feelings, or sad memories in the Story Telling tent. Every evening, these pieces of paper will be put into lanterns and set on fire during the lantern walk that wraps up the evening.